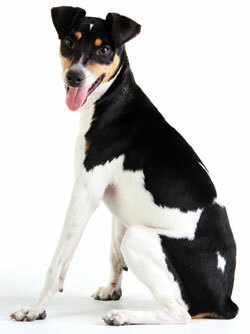 The Brazilian Terrier is an alert, fearless, playful, loyal and loving family dog. He is completely devoted, and wants to play with you constantly. He seems to be springing and bouncing all the time! He's a restless, funny, acrobatic dog who loves to run around the house, play hide and seek, and perform tricks for you. He's intense and curious: the smallest sound or movement will catch and hold his attention. He's a very good watchdog because he stands ready to bark out an alarm and takes an alert pose to warn you of a stranger's approach. He can bark too much, and must be told to quiet down. He is a trainable dog who learns at an average rate. Although an obedient and determined worker, he can also be quite spirited, and needs consistent and firm training. He's energetic and jumpy and needs a great deal of mental as well as physical activity. He needs a yard to run around in, and is generally not a good apartment dog. He is not the kind of dog who can be left alone for hours. He must be kept interested and occupied; if restless or bored, he will resort to barking and digging. He loves to dig! When outdoors, he should always be on a leash or in a safely enclosed area, since he has very strong hunting instincts and will chase after anything smaller than he is. He can get along with other dogs, but shouldn't be left alone with small pets. He is generally sociable with people, friendly and gentle with those he knows and suspicious of those he doesn't. He needs to be socialized while still a puppy so that he can learn to be polite to visitors. He is friendly and kind with responsible children who are old enough to know not to tease him, and makes a wonderful and playful companion and guardian for them. He is an excellent hunter of mice and rats and will keep your house and yard rodent-free. He is a medium-shedder, and so might not be a good pet if you are concerned about dog-hair in the home. The Brazilian Terrier is 14 to 16 inches tall (to shoulders) and weighs 15 to 20 pounds. He has a short, smooth coat. His coat color is white and tan with black, blue, or brown. He only needs an occasional brushing. You might find yourself brushing him more often, however, to remove the loose hair before it falls out in your home. One of only two dog breeds native to his home country, the Brazilian Terrier probably traces his origins to the 19th century, when Brazilian students studying in European universities came home with Fox Terriers, or perhaps Jack Russell Terriers, which were then crossed with local dogs used on Brazilian ranches, and Chihuahuas. The Brazilian Terrier eventually became a valued killer of rats, a herder, and a proficient hunting dog who works in packs to chase after wolves. He is not very well known outside his native country, where he continues to be a popular companion and pet.